Elon Musk-led SpaceX has successfully launched 64 small satellites into low Earth orbit onboard of its reusable and preflown Falcon 9 rocket from Vandenberg Air Force Base in California. This has set a new record in United States of launching satellites in a single go. It was the third voyage of Falcon 9 rocket, marking another milestone in SpaceX's cost-cutting reusable rocket technology. The 64 small satellites included 49 CubeSats and 15 micro-satellites belonging to 34 different clients including public, private and university sources from 17 different countries across the world including South Korea, France and Kazakhstan. The microsatellites weighed few dozen kilograms and CubeSats weighed even smaller. It is a private US space agency. It was founded by Elon Musk on May 6, 2002 who is its current CEO. The main purpose for its establishment was to reduce cost of space transport and establish human habitation on Mars house. Space X has developed a series of Falcon Rockets. To reduce the cost of internal transport, the space company has created re-usable rockets. Majority of these rockets are also used in other launches. Indian Space Research Organisation (ISRO) holds the record for most satellite launch in single flight. It had launched 104 satellites in one go using the Polar Satellite Launch Vehicle (PSLV-C37) rocket. Q. 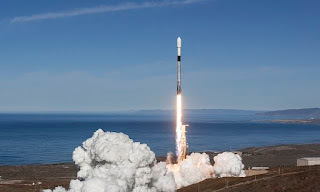 Which space agency has successfully launched 64 small satellites into low Earth orbit onboard of its reusable and preflown Falcon 9 rocket from Vandenberg Air Force Base in California?